Austrian Chancellor Kurz admits country's role in Holocaust, promises to fight anti-Semitism. Austria's Chancellor Sebastian Kurz, slammed by critics for forming a ruling coalition with the far right, marked Holocaust Day on Saturday by recalling his country's "historic responsibility" in the genocide of Jews during World War II. 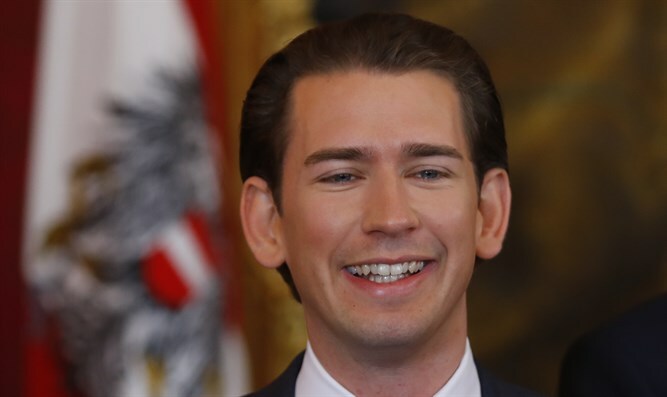 Kurz has repeatedly harked back to Austria's past as the 80th anniversary approaches of the country's annexation by Nazi Germany, urging citizens not to forget "the sad and shameful days of March 1938," when Nazi troops marched in to a rapturous welcome. On Saturday he posted a hard-hitting tweet that read: "Austrians were also actors and were associated with atrocious crimes of the Holocaust. We bear a clear historic responsibility that the new government clearly recognizes." "Today, we commemorate the over six million victims of the Holocaust. It is our responsibility to continue the fight against all forms of anti-Semitism with all determination!" Six million Jews were killed in the Holocaust during World War II, many of them in gas chambers in Nazi death camps. Kurz's comments come against the backdrop of an rise in anti-Semitic acts and speech in Austria. This week, prosecutors charged four members of a student fraternity behind a songbook containing lyrics celebrating the Holocaust and other Nazi atrocities. The lyrics of one song ran: "'Step on the gas, old Germanics, we can make it to seven million'." The fraternity's members include Udo Landbauer, a candidate from the far-right Freedom Party (FPOe) who is contesting in a state election on Sunday in Lower Austria. Landbauer, who has come under political pressure, denied all knowledge of the texts and said he had been a child when they were published. The revelations sparked a wave of indignation across the country. On Friday a protest against the far-right saw demonstrators in Vienna brandishing images of Kurz and FPOe chairman Heinz-Christian Strache in "Stop" signs and placards decrying Nazis and racism. "Recent incidents within the FPOe are a reminder that International Holocaust Remembrance Day has not lost its meaning," said former Chancellor Christian Kern, leader of the opposition Social Democratic Party. Vice-Chancellor and FPOe leader Heinz-Christian Strache on Friday condemned any form of anti-Semitism. Austria's Jewish community has boycotted the official ceremony of commemoration in parliament, not wanting to meet leaders of the FPOe, which was founded by former Nazis.